California Appears Headed Back To Drought : The Two-Way Less than a year ago, California declared an end to a five-year drought, but a lack of winter precipitation is bringing new worries. 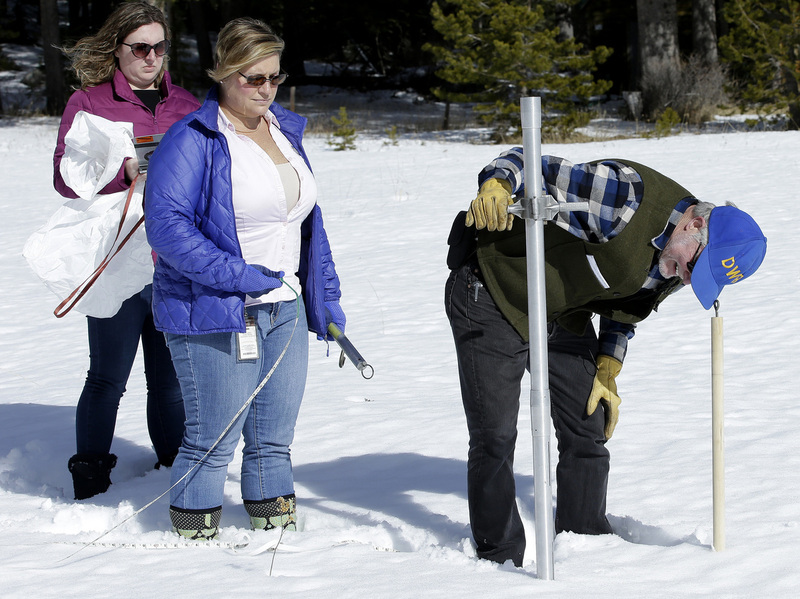 Frank Gehrke of California's Department of Water Resources checks the snowpack depth with Courtney Obergfell and Michelle Mead of the National Weather Service. Federal weather officials say that California is headed into another drought with severely dry conditions in three counties that are home to one-quarter of the state's population. That assessment, released Thursday by the U.S. Drought Monitor, says that 44 percent of the state is experiencing a moderate drought. State researchers independently measure the Sierra Mountains snowpack which accounts for about a 30 percent of California's water supply. State officials say the snowpack is less than about a third of normal for this time of the year. "If the weather continues to be warm and dry through the first week or two of February, as forecasters expect, even less water will come from the mountain snow. "'Right now we have a snowpack that is very close to the all-time record low for this time of year,' said Daniel Swain, a climate scientist at UCLA who closely tracks California's water supplies. "Not only are we not adding to this dismal snowpack, but we're detracting from it," he said, noting that high temperatures may begin melting snow at lower elevations. "We're going to be going in the wrong direction for the next couple of weeks." Less than a year ago, state officials lifted a state of emergency when a rainy winter in northern California interrupted five years of chronic drought that necessitated mandatory, and unpopular, conservation measures. However, residents in some areas of southern California say the drought never really ended for them. Southern California has seen only one major storm this season and warm temperatures most commonly associated with June are blanketing the region now. The lack of rain in Ventura, Santa Barbara and Los Angeles counties contributed to the conditions leading to the recent catastrophic wildfires. "A bright spot, said Doug Carlson, spokesman for the state's Department of Water Resources, which carries out the snowpack surveys, was that reservoirs remain fuller than usual thanks to last year's rain in the state's north."